A cesspool of wicked and deviant dehumanization of the unborn for the love of Mammon: Planned Parenthood and the Atrocity of Corpse-Selling (http://www.russellmoore.com/2015/07/14/planned-parenthood-and-the-atrocity-of-corpse-selling/). What is at stake is the systemic eradication of the being and nature of the unborn child. Scottish theologian Thomas F. Torrance masterfully deconstructs Planned Parenthood’s hellacious attempt to dehumanize the unborn for the sake of financial profit. 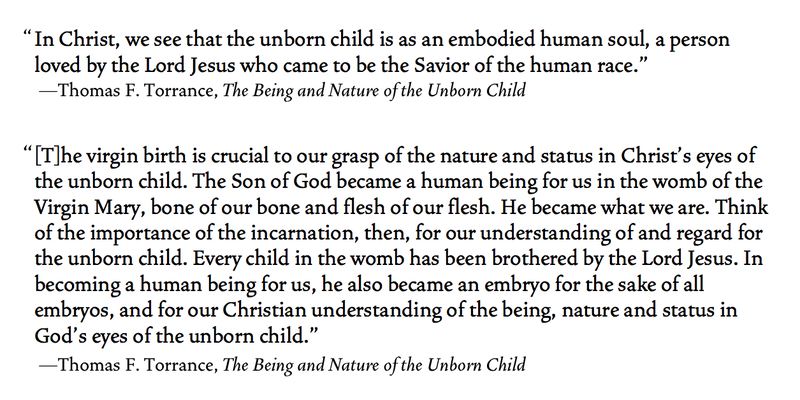 The quotations at the top of this post can be found in the following full PDF article: http://www.togetherforadoption.org/wp-content/media/Torrance-paper-on-the-Unborn.pdf.